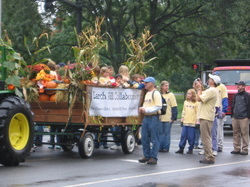 The Larch Hill collaborative was formed in 2004. Its annual fund-raising event, The Larch Hill Cross Country Run, is held at Bramble Hill Farm. The Run is a three-mile, old style English cross country race complete with obstacles, mud and a potato roast at the end. It attracts runners across a broad spectrum from competitive racers to families running or walking with their children. The Farm shares a border with The Hitchcock Center (an Environmental Education Center) and the Common School (a private K-6 elementary school with a curriculum based on “in-depth studies and experiential learning”). Amherst College maintains several hundred acres of pasture land across Rt. 116 from the Farm, and the Town Conservation Commission maintains land along another Border. The Larch Hill Collaborative was formed, with Bramble Hill Farm at the center, to bring these entities together into a working group around shared concerns for the sustainability of the land and the ecosystems which form the core of all of our individual work.